REC has secured 85 University Ranks in Apr/May 2018 Examinations and stands in 5th position among 552 Engineering Colleges in Tamilnadu. The Batch of 2019 has received 1044+ offers (as on 20.04.2019) from some of the leading companies. In addition to academics, our students get a holistic exposure to extra curricular activities such as sports, music, dance & cultural festivals. W​ith a sprawling 7 lakh square feet campus​, REC has one of the finest college campuses in the country. University RanksREC has produced 85 University Ranks in 2018 batch. REC is in the Top 15% of all Engineering Institutions in India ranked under NIRF for the third consecutive year. REC is ranked 15 in India's Top T-Schools (Private) by Dataquest T-School Survey 2019. REC is ranked 20th in Top 100 Private Engineering Colleges in India & 6th in Top 20 Engineering Colleges with Excellent Industry Exposure by Higher Education Review Magazine. Thank you Students, Parents, Faculty & Staff!. REC wins Salesforce Trailhead New India Student Championship 2018. REC is the NATIONAL WINNER in the Salesforce Trailhead New India Student Championship 2018 amongst 120 Institutions Nationwide. Thank you Students and Faculty Coordinators. You made it HAPPEN. REC wins Award in PALS 2017-18 Initiative. REC wins BEST PARTNERING INSTITUTE in Chennai Cluster in the PALS 2017-18 Initiative awards. REC is declared as WINNER of InnoWAH - Best Innovative Project Competition in the PALS 2017-18 Initiative. REC is now a proud member of United Nations Academic Impact (UNAI), a global initiative that aligns institutions of higher education with the United Nations. Through this, REC will strengthen its cooperation with the UN system and promote information exchange with the universities that provide UN-related education programs. REC students developed an innovative solution for ISRO to help in document tracking within the agency and won FIRST PRIZE in the AICTE Smart India Hackathon 2017 competition. The competition posed 500 odd problem statements to technology across the country. Rajalakshmi Institutions inks pact with Universidade de Vigo (Spain), Universidade da Coruña (Spain), Universidade Federal de Juiz de Fora (Brazil) to develop academic and educational cooperation, and collaboration with a view to furthering the technological and scientific development and a practical implementation of knowledge to benefit society. Mr.Chahat Agarwal, Mr.P.Tharun, Mr.S.Vicknesh, Mr.Yaseen Hussain, Mr.Kaviarasu and Ms.Janar Priyanka of Third CSE has won FIRST PRIZE in AICTE Smart India Hackathon under ISRO category conducted by MHRD. The Prize was awarded by ISRO Chairman Dr.A.S.Kiran Kumar. REC has climbed to 5th position in the Apr/May 2017 Anna University Examinations among 552 Engineering Colleges in Tamilnadu. Thank you Students & Faculty. REC is featured in the grand issue of Higher Education Review yearly magazine (2016 edition) as Engineering College of the Year 2016 - Employer Satisfaction. REC has been ranked as 27th best Private Technical Institution by DataQuest in the Top 100 Best Techincal Schools Dataquest-CMR T-School Survey 2016. REC is ranked 21st in Top 100 Private Engineering Colleges in India & 13th in Top 20 Engineering Colleges in India in Placements in the Top 100 PRIVATE ENGINEERING COLLEGES SURVEY 2016 by Higher Education Review. REC is listed as ONE of the TOP PRIVATE ENGINEERING INSTITUTE in the TIMES ENGINEERING INSTITUTE RANKING SURVEY 2016. We provide opportunities to the students interested in doing internship on "MEMS & Microfluidics". If you are interested in doing an internshiip, please email your profile to head.cemm@rajalakshmi.edu.in. REC has produced 92 UNIVERSITY RANKS in 2015 batch and stands in 6th position among all the Engineering Colleges in Tamilnadu in the Apr/May 2015 Anna University Examinations. THANK YOU Students for bringing laurels to the Institute. THANK YOU Faculty for your tireless efforts. THANK YOU Parents for your faith in us. Rajalakshmi Engineering College has been ranked 22 across India amongst all Private Colleges by DataQuest in the DataQuest-CMR Survey Top Tech Schools 2015, ranked based on survey of colleges, employers, and alumni. Mr.K.Sriram and Ms.S.Savitri of final year Biotechnology has won second place in the National level quiz conducted by one of the most prestigious Indo-Japanese forum NCRM NICHE on Stem Cell and Regenerative medicine on 10th October 2015. 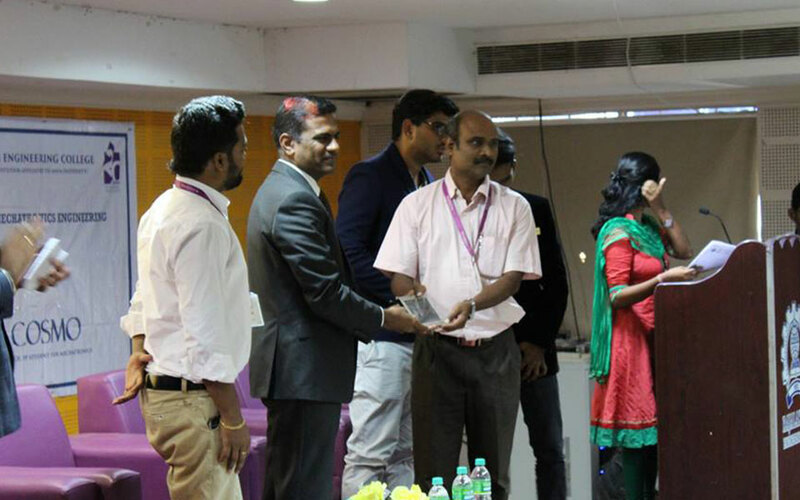 We are happy and proud to share that our student Mr.K.SRIRAM of Final Year B.Tech Biotechnology is the Winner of "Voice of BT: An Intercollegiate National Public Speaking Competition" organized by Novozymes South Asia Private Limited held on 28.08.15. He is honoured with a Medellion, Cash Award of Rs.20,000 and Internship for 6 Months in R&D Unit, Novozymes, Bangalore. Kridayanthrik'18, organized by the Department of Mechanical & Mechatronics Engineering was held on 17.09.2018. 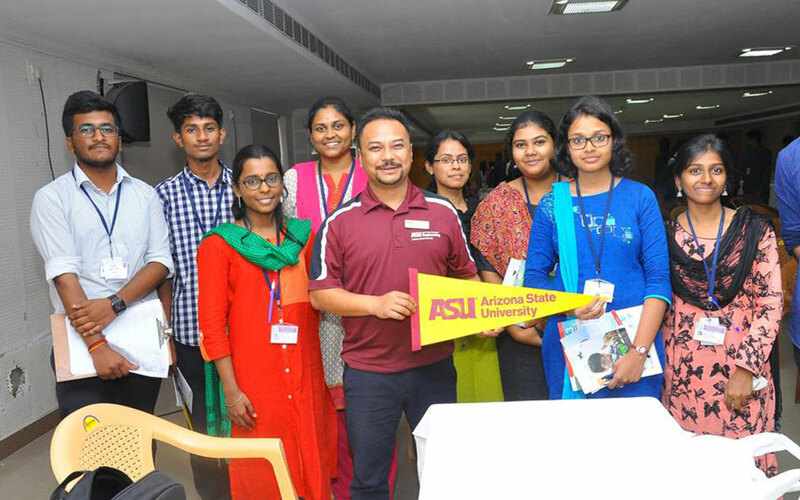 USIEF Mini Education Fair held at REC Campus organized by EducationUSA, U.S. Consulate General Chennai, BC Exams (IELTS) and United Healthcare. The college has shown excellent progress in not only teaching-learning process resulting in excellent university results but also developed research and innovation. Delighted to be with a leading institution—REC, interacting with the faculty and students. Research context in education is essential for the future. I see good progress has been made in this direction, especially creating Centres of Excellence. Chief Controller, R&D, DRDO, CEO & MD of BrahMos Aerospace. 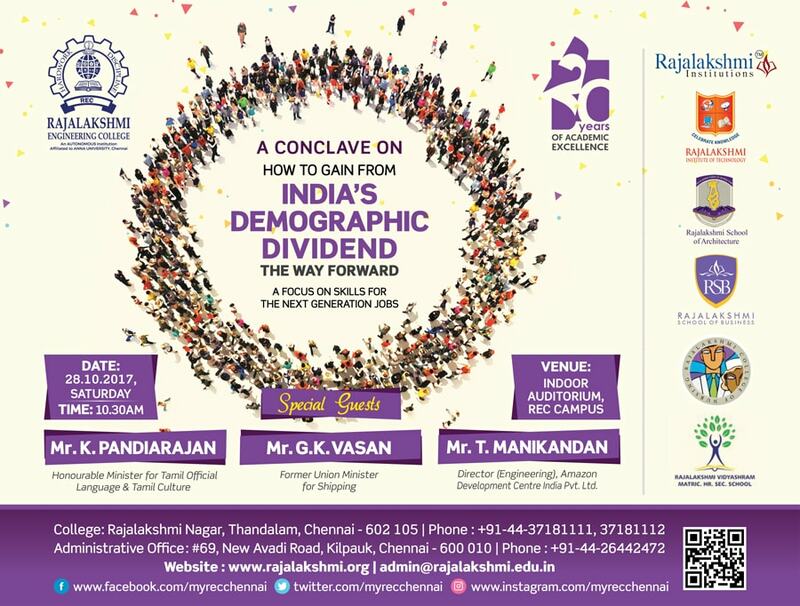 It is a great honour to talk to the students of Rajalakshmi Engineering College on visioning for India. It has been a great experience visiting this professionally excellent institution. I can proudly say that Rajalakshmi Engineering College has made a great difference in Engineering education. The passion for good education is visible and management is not cutting any corners that is why it is a Centre of Excellence. It has been an opportunity to be in the College. It is an inspiring example of what India needs to do. I wish the College continuing success to fulfil their aspiration.